It may have escaped the attentions of thousands of football fans in England who get their kicks watching the Premier and Football League in recent weeks, but us little old Non-League clubs haven’t had a good Christmas or New Year. 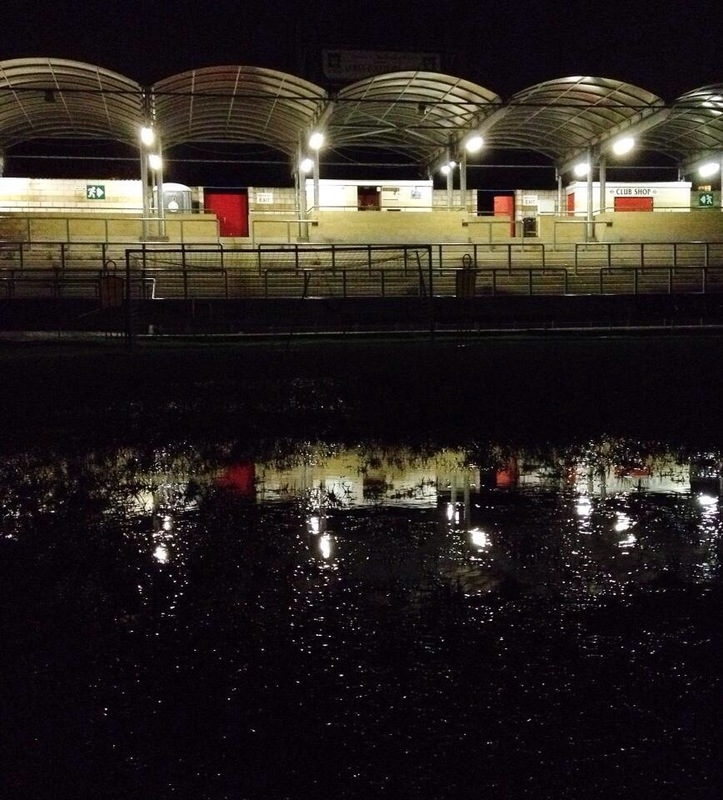 The persistent rain in the past 4 weeks has seen Lewes lose four league games to the weather, including the two money-spinning Christmas home games against AFC Hornchurch and Maidstone United. The latter game on New Year’s Day would have seen the first, and almost certainly, only four figure crowd at The Pan this season. We can say with some confidence that the postponement of that game alone will have cost the club thousands of pounds which we have no way of getting back. But today is a story of unsung heroes. Throughout the last few weeks our Pitch Team, brothers Jack and Joe, along with our General Manager and Club Sec Kev and put in hours at all times of day and night to get pitches ready. Super human effort on New Year’s Eve trying to clear the pitch of water when everyone else was tucking into their JaegerBombs went unthanked by the weather as just as they had got the grass in shape, another deluge overnight made it unplayable. On Wednesday this week the game was 50/50. Thursday it was 25/75 and then the real rain started on Thursday night. Nobody connected with the club could see this game going ahead. Another blank weekend both for the footballing fans in Lewes and the coffers of the bank account beckoned. At 10.30pm last night. this is what the pitch looked like (thanks to Mr Boyes for somehow sneaking onto the pitch to take a snap) and an early inspection was planned to tell us the inevitable. But miracles do happen. At 9.30am the water had disappeared and the inspection was cancelled. We had a game…finally. Jack and Joe Fingerneissl were to be the toast of the Dripping Pan. The good news was that the Rooks were in fine goalscoring form, slotting in seven in the past three games. The bad news was that we had also conceded seven in those same three drawn games. Three great games to watch for the neutrals, none more so than on Tuesday night when after just thirty minutes the 20 or so Rooks fans who had made the trip to deepest and darkest Essex were rubbing their eyes in disbelief as Luke Blewden put us three-nil up against Canvey Island. Free flowing football that would have had Sam Allardyce recoiling in horror was a joy to watch. Alas, the second half display was more akin to watching West Ham as the Rooks conceded 3 goals in a fifteen minute period to give the home side a share of the points. But today would be different, right? 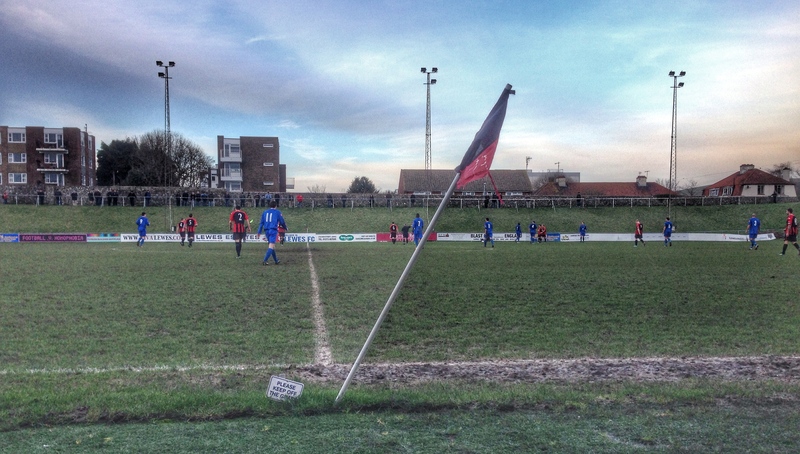 Harrow Borough were the visitors and our recent record against them was pretty impressive. Three win and a draw since our return to this level against them was surely a good omen of what would happen this afternoon? In the corresponding fixture last season, Harrow’s manager and vocal star of the Non-League Show on BBC5 Live Dave Anderson was sent off after suggesting that the referee was “like a child on Christmas Day” for the amount of “presents” he gave to Lewes in the 4-2 win. We shouldn’t need any help from the officials this season to get a long overdue win, surely? But let’s not forget that we actually had a game to watch, and a team who were a million miles away from the one we watched last season. Football should be played with a smile on everyone’s faces – a fact we often forget. 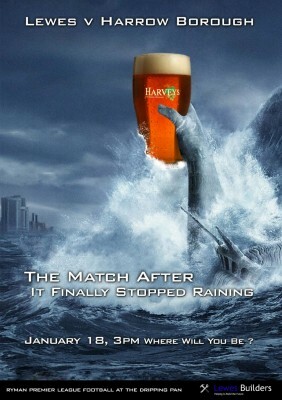 Lewes 1 Harrow Borough 1 – Saturday 18th January 2014 – The Dripping Pan In the end it was a familiar visitor that cost Lewes 3 points. The ghost of season’s past – the late equaliser. 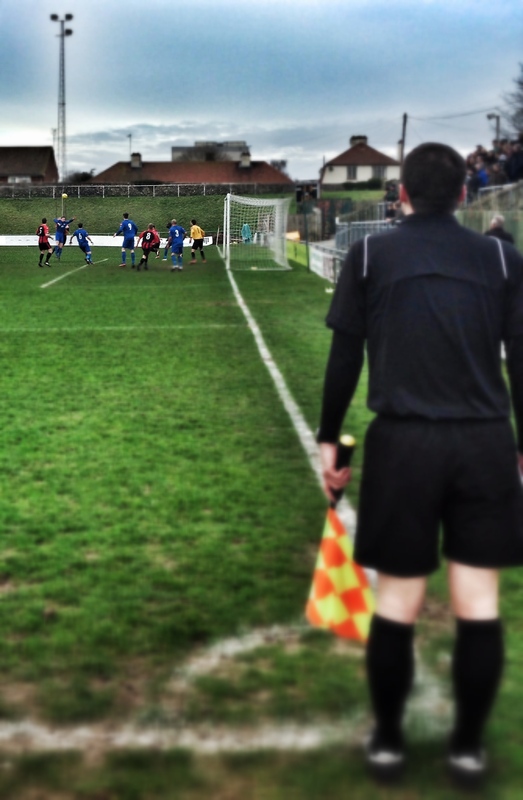 Despite dominating the game, Lewes could only find the net once and eventually were made to pay. However, despite the result, there were many positives from a game that stretched our unbeaten home record to over two months. Personally, it was a good day. The microphone was thrust in my hand 10 minutes before kick off and I managed to perform admirably, remembering to announce the teams without an issue, getting both scorers right and not forgetting to do the half-time announcements. I did miss one of the Harrow Borough’s second half substitutions, but I don’t think anyone noticed (really) and I announced the Golden Goal as 58 minutes, much to the annoyance of Terry who had 57 minutes on his ticket and then offered me half the cash if I announced there had been a Stuart’s Inquiry (copyright Dave Lamb for thinking that one up) and it was really 57 minutes. Then I found out I had won second prize in the monthly Panning For Gold draw and for once made a profit out of coming to a Lewes game. The team certainly hadn’t let the second half performance at Canvey Island get to them as they set about trying to break down a stubborn Harrow Borough. Early pressure saw the Harrow keeper Shea called into action and it seemed like it was only a matter of time before Lewes would open the scoring. Despite some neat build up work including 4 (FOUR!) instances of Crabb triangulation in the first half (Crabb passes to Crabb who then plays it to Crabb) the Harrow back line mopped everything up thrown at them. Lewes finally took the lead when Millwall loanee Charlie Penny rose at the near post to head home just before the hour and we all relaxed and expected a second or third. But it was not to be. Despite some great interplay outside the area, once again it was the Harrow defence that had the last laugh. With no physio on duty for the visitors it was left to Lewes’s Natalie to help out the opposition when injuries occurred. With just ten minutes to go she had just helped one of their players off the field. And her thanks? Harrow broke, played the ball to the right and Lucien struck the ball across Rikki Banks into the corner of the net. That wasn’t in the plan. It wasn’t the result we all hoped for but let’s look at the positives. 1) An above average crowd of 564 enjoyed a decent game in dry conditions 2) A good performance from the officials (not often you can say that!) who kept the game flowing 3) A £30 windfall from the monthly draw 4) A positive performance from the team that keeps the unbeaten run going 5) It was a game that nobody saw being on 24 hours previously And point five sums it up. We got to watch a game irrespective of the final score and for that we have to thank those unsung heroes such as Jack and Joe….564 people saluted your hard work today.